The unfortunate truth of our society is that we cater to people who walk, and that people in wheelchairs have many issues to contend with when it comes to mobility. It does not matter how readily they can handle their wheelchair if the world does not give them the basic requirements to get around, such as wheelchair ramps where there are stairs. Even if your home has a lift or a ramp, you still face problems whenever you visit a friend’s home or a business and realize there is no ramp for your chair. However, there is a way to help combat this inconvenience. While it would be wonderful if all homes and businesses installed a ramp, the best solution in the here and now for your troubles is a portable wheelchair ramp. No matter where you travel or what businesses you visit, your folding wheelchair ramp will allow you access to the building or vehicle with little to no fuss. Owning a portable wheelchair ramp will allow you to easily access the world without the same troubles as before. The portability means you can take it anywhere, be it for a leisurely trip to a movie theater or to the bank to speak to an accountant. You can take your own wheelchair ramp with you wherever you go, and you will not have to worry about whether you will be able to get into the building. A good portable wheelchair ramp will be large and sturdy enough to account for both your own weight and the weight of your chair, be it light like the best lightweight transport wheelchairs, or heavy like the best outdoor mobility scooters. This is the most important aspect of your ramp, aside from its portability. However, it should also be compact and easily transported, in order to allow you maximum mobility and usage. When you find the right ramp for you, everything will seem much easier. Perhaps you are unsure where to start in your search for a good folding wheelchair ramp. Here are the top 4 portable wheelchair ramps on the market, and what makes them the best. Maybe one of these is exactly what you need. This portable wheelchair ramp is one of the best available, with a 600-pound weight capacity and its availability in various lengths. It has approximately 4.3 out of 5 stars from Amazon reviews, and it is frequently touted as being one of the best. It comes in various lengths, and even includes a travel bag for easy carrying. This sleek ramp is 30” wide, no matter what length you buy, and its surface is slotted to prevent water from collecting on it, even in rainy weather. Reviews say it is lightweight and easily portable and can easily accommodate various types of wheelchairs and some scooters, as long as they are narrow enough. With a weight capacity of 600 pounds, this ramp is very solid. It is able to accommodate both traditional and electric wheelchairs that are less than 30 inches wide. It is relatively light for a ramp, is avaliable in lengths from 3 to 6 feet, and comes with a carrying case. And as an added bonus it has perforated slots to prevent water from pooling on the ramp. A few reviews stated that the unit doesn’t arrive as pictured, in that the handle is smaller than they anticipated. And there were one or two reports of having trouble with the hinge, but it wasn’t a common occurrence. This wheelchair ramp is both sleek and efficient. It has the same weight capacity of the ramp above with a 600-pound limit. 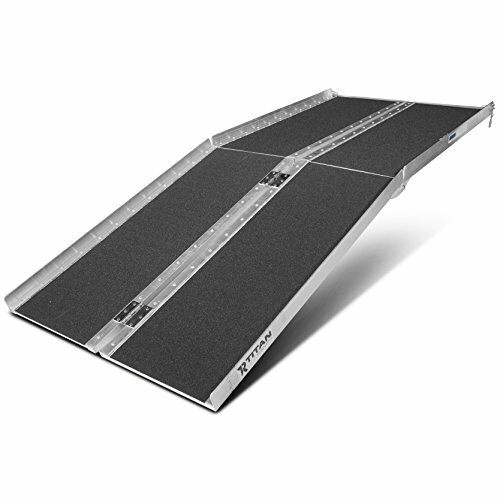 The Titan ramp, however, has a slip resistant surface for easy wheelchair traction. It is made of aluminium, and it is a bit heavier than some ramps, weighing in at around 40 pounds. It has a 4-star rating on Amazon, with generally positive reviews. However, it is a 6-foot-long ramp with good flexibility for easy placement and use in all sorts of situations. It has a 2.5” angled lip with holes to easily secure the ramp in place. It even has a soft nylon carrying handle for easy portability. Despite its seemingly overwhelming length, it is incredibly easy to carry this tool around. Is the Titan the right ramp for you? This ramp has a sleek appearance, and includes a slip-resistant surface that provides excellent traction. It is six feet long and offers a six hundred pound weight capacity, but also comes with a soft nylon carrying handle that makes for easy portability. This ramp is on the heavy side, weighing in at close to forty pounds. It also doesn’t include a full carrying case, but rather folds into a compact shape with a handle. 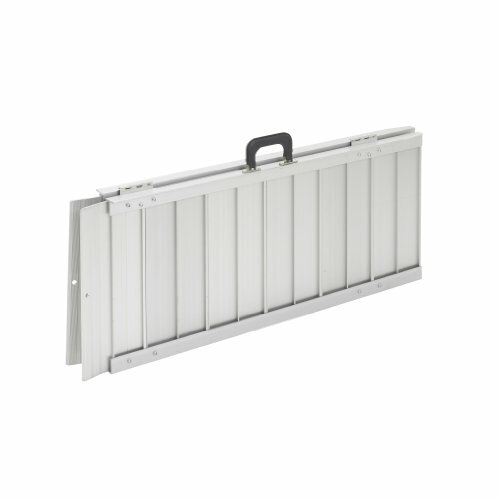 The SFW330 is a great, easy to carry ramp that is available in a few different lengths. All of the ramps are 30 inches wide, and can accommodate wheelchairs of any kind as long as they are 30 inches or less from wheel to wheel. This is an incredibly stable ramp, with a weight capacity of 800 pounds. Unlike other ramps, this portable wheelchair ramp is welded rather than riveted. This makes it stronger than some of the other ramps out there, and ideal for heavier individuals or heavier chairs and scooters. It also features a handle for easy carrying. It even has an anti-slip, skid resistant surface to prevent potential accidents. It is somewhat heavier than other models, but its usefulness and sturdiness are worth a few extra pounds. Here is just a brief summary of what makes this a great portable ramp. This ramp is rated for up to 800 pounds, making stronger than most of its competitors. Part of that durability comes from its welded construction, which is different from many competing ramps that are held together with rivets. It comes in lengths from two to five feet long and 30 inches wide, and features an anti-slip skid resistant surface. And it also features a handle that allows it to be carried like a suitcase. A few reviewers thought the middle hinges protrude, but others say that isn’t a hindrance. And some question if the edge design could lead to a chair slipping off. 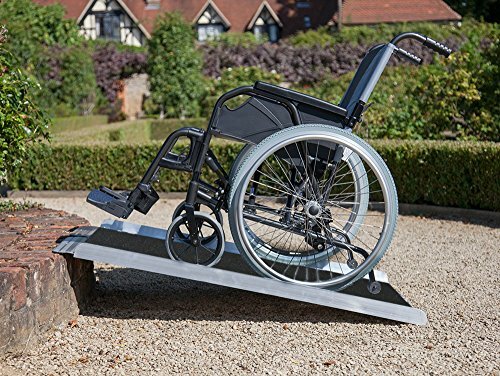 The Clevr non-skid portable ramp is constructed of reliable aluminium and can easily support chairs and their users up to 600 pounds. At 36 inches long, this ramp is ideal for entering most homes or small businesses. This size ramp is intended only for use in height rises of 6” or less for maximum safety, but this is perfectly suited for many common situations. This portable ramp is 31 inches wide, and features a high traction, grit surface which is perfect for traditional and electric wheelchairs. When folded, it has a simple carrying handle, and measures approximately 16 inches wide by 3 inches high, which is easily transportable. With its small size, it is relatively lightweight, weighing in a bit less than 20 pounds. 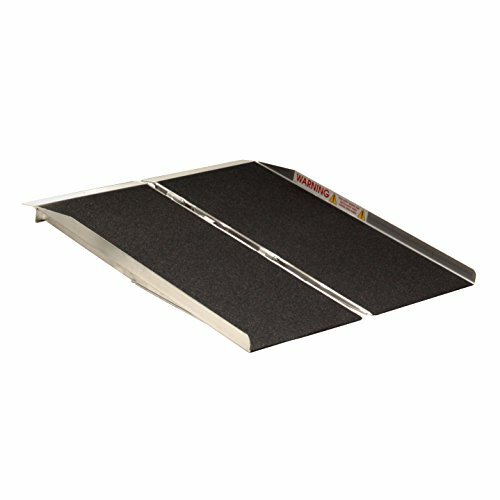 The Clevr 36 inch ramp is great for anyone looking for a small, easy to use ramp. While only three feet long, this ramp is 31 inches wide, which is slightly wider than many of its competitors. It can support up to six hundred pounds, and has a gritty high-traction surface to combat slippage. As a smaller ramp it is very compact and easy to transport. Due to its short length this ramp is really only suited for one or two steps. Also, some think that there aren’t enough ways to secure the edge during use to prevent slipping. ADA COMPLIANT: According to ADA recommendation, 36" long ramp is suitable for less than 6" height rise from the ground, maximum height rise for unoccupied wheelchairs and scooters is 10". HIGH WEIGHT CAPACITY: Durable aluminum construction supports up to 600 lb capacity making it perfect for heavy scooters and electric wheelchairs. Portable wheelchair ramps are a great solution to a problem that has yet to find a permanent solution. Someday, perhaps, homes and businesses will utilize ramps to their fullest, and the world will be more accommodating to differently abled people rather than solely focusing on the able bodied. However, until that day arrives, folding ramps are a great solution that can make your life so much easier. There are lots of wheelchair ramp models available today. Some are made of different materials, or have different surfaces. Some are quite long, where others are solely for conquering small height rises. Whatever the case may be, there is a wheelchair ramp out there for you. These are just the top 4 portable ramps, and one of these amazing models is sure to help you feel that much more ready to conquer the world.